And so it ends. As always at the end of a book series I’m left feeling somewhat deflated; not through disappointment but from the realisation that it’s over. The characters I’ve ridden alongside for a couple of thousand pages are nothing more than literary dust on the wind. The locales must retreat to corners of my mind, probably never to be visited again. So following my enthusiastic review of the first two installments of The Mongoliad, how did the conclusion hold up in comparison? In a word – scrumptiously. As a reminder there were four distinct threads being woven by the writing team. The primary plots concerned the Mongols led by the sons of Genghis Khan and the Shield Brethren, noble knights who have sworn to destroy them. In the Eastern Europen of Hunern, Ongwei Khan presides over a bloody tournament, challenging the whole of Christendom to send their bravest champions to test their mettle against his own prize warriors, captives from previous conquests. If the West is victorious he will pack up and return to his homeland, or so he claims. The Shield Brethren decide to play the Khan’s game, competing in his bloodsports yet all the while seeking a chink in the Mongols’ armour – a chink which reveals itself in the form of the very slaves they confront in the arena. This strategy is little more than a feint however. Feronantus, leader of the Shield Brethren, is leading an elite group of knights and their allies east with one goal in mind – the assassination of Ogedei Khan, ruler of the Mongols. His death would result in a recall of the horde to Mongolia in order to appoint new Khagan. Their journey is hampered by mystical visions, enraged comrades and by a particularly adept Mongol whom they christen Graymane for his shock of white hair. Totally oblivious to the approaching threat, Ogedei seeks to wrestle control of his life back from the alcoholic mess it has become. To this end he begins a pilgrimage to the hunting grounds held sacred by his father, seeking to hunt a great spirit bear and recapture the respect of his followers. In the meantime there is unrest in his camp between his highest officers and unbeknownst to him he has a Shield Brother in his midst, one of his spoils of war. Mixed in among these storylines is the odd one out, that of Ference, Ocyrhoe and Father Rodrigo and their travails in Rome. Survivors of a great Mongol massacre on the fields of Mohi, Ferenc guides Rodrigo back to the spiritual heartland of his faith where he believes he must deliver a vital message of prophecy to the Pope. Little does he know that Gregory has passed on, leaving the Cardinals in disarray as they struggle to elect a successor with the Senator of Rome and the Holy Roman Emperor, Frederick II, snapping at their heels. Political subterfuge rather than action is the name of the game here as various parties align to have their chosen candidate nominated to the papacy for more or less heinous purposes. The three core subplots work together perfectly, the pace being notched up inch by inch towards a breathless and bloody climax. The Roman story seems a little out of place in that it has more or less zero connection to the others save for choronology but it provides some light relief in the forms of the Cardinals … and … and in the wonderfully realised figure of Frederick The Great. Recognised by many as a genius aand enlightened soul far ahead of his times, the Emperor is depicted here as a straight-talking and gutter-mouthed everyman, dispensing wit and wisdom in stark contrast to the pious, measured tones of the Cardinals and Shield Brethren. I’d happily read a whole volume dedicated to his exploits alone. Unfortunately there is a glaring flaw with the conclusion of The Mongoliad. The communal, scene-driven nature of the collaboration, while novel and refreshing in the first two books, becomes just a little too fragmented towards the end. Instead of lengthy chapters taking care to develop and advance the storyline in each tale we are now dealt tiny snippets reminiscent of the flash-cuts so beloved of modern Hollywood action movies. Scenes change in mid-sword swing, giving us barely enough time to refresh ourselves with each scene before we are transported thousands of miles away. I appreciate why this was attempted but it just doesn’t work when taken to this kind of extreme – a book simply is not a movie and there’s only so much jumping around you can do before it becomes tiresome. On first hearing the notion of The Mongoliad my initial reaction was excitement at the prospect of new material from Neal Stephenson. My favourite author of recent years taking on the Crusades and the offspring of Genghis Khan? Bring it on! However, the fervour was soon tempered by the presence of co-writers. How could seven individuals possibly cooperate to produce a coherent narrative? How could their individual styles blend together without the seams becoming distractingly apparent? The answer, I’m pleased to say, is near-perfectly. The Mongoliad is a pioneering attempt at collaborative fiction using every modern medium at the authors’ disposal. The group – including Stephenson and such sci-fi luminaries as Greg Bear and author/blogger Mark Teppo – initially began crafting the story chapter-by-chapter in an online serialisation. From this sprouted a website and active fan community and the eventual collection of the tales into three paperback and digital volumes. As for the story itself, the team has delivered a masterful piece of historical fiction, set in the 13th Century against a backdrop of Genghis Khan’s conquest of the known world. In Karkorum his son, Ogedei, is struggling with his position as Khagan, the Khan of Khans. Haunted by his brother’s sacrifice to save his life he drowns himself in alcohol, threatening to destabilise the Mongolian Empire as they flounder under a laughing stock of a leader. Meanwhile in the West his surviving brothers continue their assault on Christendom, Ongwhe staging a tournament promising to spare Europe further devastation of their greatest champions can best his own in single combat. Amongst those taking up the challenge are the Shield Brethren, a monastic order of knights sworn to protect those in need and whose martial skills are unmatched across the land. Becoming suspicious of Ongwhe’s circus they decide that the only way to remove the hordes from their homeland is too cause the Khagan’s brothers to return home. Only one event could spur such a retreat – the death of the Khagan himself. 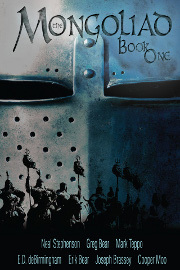 The knights divide their forces, the majority remaining at the tournament to provide cover while a handful embark on an impossible, suicidal mission across thousands of miles of hostile territory. Meanwhile back in Ogedei’s court his slide into self-destruction has not gone unnoticed. Members of his inner circle use his perpetually clouded judgement to further their own ambitions while the Empire crumbles around them. In an attempt to mitigate the damage one of his brothers sends an envoy with a mission to part him from the bottle at all costs. Gansukh, a fierce warrior of the steppes, is ill-suited for court life and assigned the Chinese slave Lian to educate him in politics, history and guile. 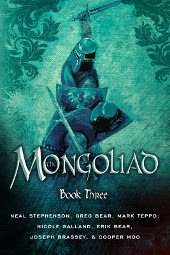 The first book of The Mongoliad weaves these three strands – the tournament, the quest and the court – into a gripping story brimming with the action and political intrigue beloved of fans of George RR Martin. Given the serialised nature of the undertaking each chapter deals with a single story thread, typically presenting the reader with a good old-fashioned cliffhanger to keep them salivating until the following two chapters are completed. In fact so deft is the storytelling that it’s almost an annoyance to be forced to leave one group of characters for a couple of dozen pages at a time – until, that is, you remember that the other sub-plots are equally captivating. It’s a masterful juggling act and never once do the team fail to keep all the balls in the air. By the time the second book rolls around – which will be in the space of a couple of days if you devour the first as ravenously as I did – then we find The Mongoliad’s world expanding in scope. We’re treated to some expository flashbacks involving Francis Of Assisi before joining a whole new plot taking us to the heart of the Christian Empire, Rome itself. Here the machinations of the political elite in trying to influence the election of a new Pope bring an altogether more Machiavellian flavour to the novel. You’ll also notice that the authors have become more comfortable in their world, with the seriousness of the first instalment giving way to more humour and numerous subtle genre references. As mentioned before my interest in The Mongoliad was piqued by the involvement of Neal Stephenson, an author who has proven his skills with labyrinthine plots in The Baroque Cycle and Anathem and with fast-paced action sequences in Reamde (to be reviewed shortly). The Mongoliad passes the action and intrigue tests with aplomb, never once falling victim to the endless inconsequential tangents of Martin or the dreary descriptive prose of Tolkien. In the action sequences this is largely due to the laudable dedication of the authors themselves, having thrown themselves into weeks of gruelling martial training purely to allow them to write more accurately and honestly. I’ll conclude this review here before I start drooling like an obsessed fanboy. Suffice to say that parts one and two of The Mongoliad far surpassed my inflated expectations, making a mockery of complaints that there was a dearth of action and that it was essentially the tale of an extended journey to the east. Far from it, this is one of the most vibrant and exciting novels of recent years, sinking its claws into you from the opening chapters and refusing to reliquish its hold till long after the last page is turned. Now if you’ll excuse me, the third and final chapter begs my attention.